If there’s one place in North America that’s known for being a huge draw each year for honeymooners and other in-love duos, it has to be Niagara Falls. Loved-up couples have been flocking to this spot on the American-Canadian border for many years, mainly due to its famous, powerful waterfalls. However, there are plenty of other activities to enjoy with your partner while you’re in this part of the world. To help you plan your itinerary, whether you’re in town for your honeymoon, a birthday celebration, an anniversary getaway or your first trip together, read on for some top ways to have a memorable, romantic vacation in Niagara Falls. Of course, one of the first things on your list will be to see the famous waterfalls. There are numerous ways to check them out, but one of the most popular is on the boats that get right up close to the thundering waters. On the Canadian side of the Falls, you will travel with Hornblower Niagara Cruises, while on the American side you’ll book a ticket on the Maid of the Mist. Both tour operators get passengers close to Niagara Falls; so close, in fact, that they provide ponchos to wear over clothes so you don’t get soaked! A more romantic way to see the waterfalls, as well as the surrounding region, is via the Niagara SkyWheel. This Ferris wheel, situated in the Canadian suburb of Clifton Hill is the biggest observation wheel in the country and provides many excellent photo opportunities. You can also cuddle up comfortably during the four or so rotations the ride takes, as you’ll be seated in a gondola which has heating and cooling for comfort all through the year. It’s wise to hop on the SkyWheel after dark, too, so you can see the nightly Falls Illumination light show as you travel. 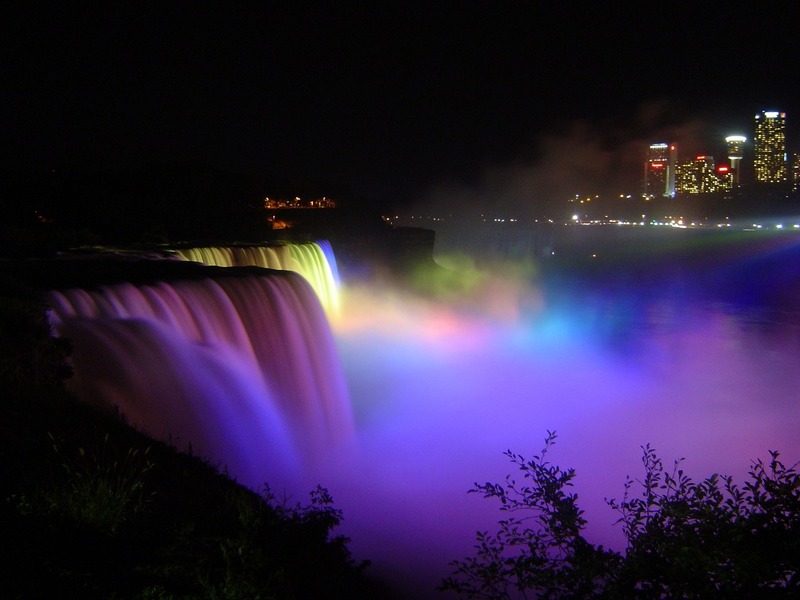 It lights up the waters of the falls and features fireworks. After all your walking and exploring in Niagara Falls, you’ll probably be ready to relax in a spa. In the city, you will find all sorts of retreat options, from those in hotels to boutique, independent beauty salons and more. For a true indulgence together, consider finding a Niagara Falls spa that offers romantic couples’ massages and other options like downtime in a Jacuzzi or steam room and some added nibbles and bubbly to consume. Most people enjoy having a good meal and some nice wine while they’re on a romantic vacation. Happily, in Niagara Falls you don’t have to look far for either. In particular, if you love to visit wineries, you’re in luck because there are over 25 of them open to the public and located only a 15 to 20-minute drive from the center of town. The pretty-as-a-picture suburb of Niagara-on-the-Lake is one of the most recommended spots for a day trip. Here you’ll find many top vineyards where you can try local wines and have a meal at an on-site restaurant. Many places will even pair wines to go with each course for you. In Niagara-on-the-Lake, one of the most lauded vineyards is Inniskillin Winery. This producer is famous around the world for a particular type of dessert wine known as Icewine. Icewine gets its name from the fact that it’s made using grapes picked only after being frozen on the vines during winter. Another idea when it comes to eating and relaxing as a couple is to pack yourselves a picnic lunch and eat it in pretty gardens. An excellent spot for this is the Niagara Parks Botanical Gardens. Situated approximately 10 minutes’ drive from the middle of Niagara Falls, the gardens are huge, covering 40 hectares, and have been operating for years, after being developed in the 1930s. You might want to set up your picnic lunch within the rose garden. Here there are close to 2,500 different rose bushes, which as you can imagine provide a lovely scent background for your meal. Also, have a wander around the Butterfly Conservatory. This section of the botanical gardens houses more than 2,000 butterflies of more than 45 different species. Since the park is so large, you may be keen to see more of it in comfort, conserving your energy. If so, take a romantic horse and carriage ride throughout the gardens. Niagara Falls is a great spot to visit just about any time of year. If you’re looking for more travel tips or pro blogger budget flight tips, be sure to subscribe so you never miss a post!